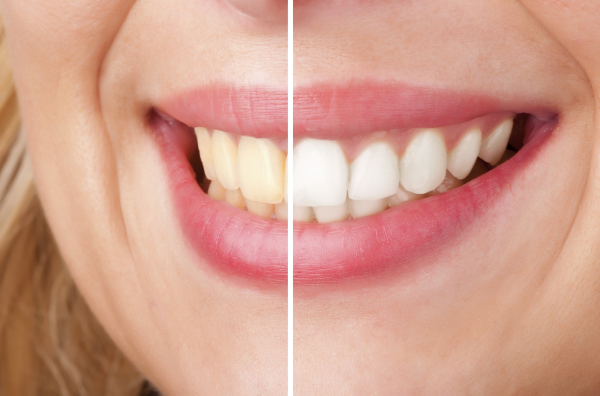 Yellowish stains develop on teeth as people get older. You might also get stains from drinking cola, tea or coffee. The stains may dim your smile, making you feel less attractive and reducing your self-confidence. Teeth whitening removes the stains and brightens your teeth. Many people choose to have a teeth whitening procedure done before their wedding, a job interview or another special event. If your teeth are lightly stained, a simple solution may help to brighten your smile. Your dentist may recommend a specific type of whitening toothpaste or mouth rinse to lift stains from your teeth. For moderate staining, your dentist may be able to provide you with an at-home whitening kit. These kits use a higher-grade bleaching solution and trays that fit over your teeth. Carefully follow the instructions provided by your dentist for these kits. For more dramatic results, consider an in-office teeth whitening procedure performed by your dentist. In the office, the dentist can apply a bleaching gel to customized trays made just for you. The whitening process takes about 60 minutes. The procedure is usually performed after a cleaning and oral exam to make sure you do not have any cavities that could be irritated by the bleaching solution. Your dentist can determine if a teeth whitening procedure is right for you. In general, people with healthy teeth and no fillings can have their teeth whitened. If you experience some sensitivity after the teeth whitening procedure, a toothpaste for sensitive teeth may help. You could also use dental fluoride to reduce sensitivity after whitening. When you are seeking teeth whitening for a brighter, better-looking smile, call Kesteven Dental Care Studio.